Huawei Mate 10 vs Huawei Mate 10 Pro: what’s the difference? Is it worth going Pro? There’s been no shortage of phablets this year, but two more have just arrived in the form of the Huawei Mate 10 and the Huawei Mate 10 Pro. And they may well have been worth the wait, thanks to AI smarts, dual-lens cameras and plenty of power. But these two phones are also quite different in many ways, and while the Mate 10 Pro is higher-end overall it’s actually not a match for the standard Mate 10 in every area. With that in mind we’ve created this guide to the differences between the two, highlighting where they’re similar and where they’re not in their design, display, power, camera, battery and price. The Huawei Mate 10 and Huawei Mate 10 Pro have similar designs. Both phones have a glass back with curved sides and a reflective band running across it. That band is the main design flair and serves to highlight the dual-lens camera sitting in the middle of it. But while the look is similar there are some differences. For example, the Huawei Mate 10 comes in at 150.5 x 77.8 x 8.2mm and 186g, while the Huawei Mate 10 Pro is 154.2 x 74.5 x 7.9mm and 178g. Not a huge difference then, but the Mate 10 Pro is longer, slimmer and lighter than the Mate 10. The two phones are also available in a different selection of colors. The Huawei Mate 10 is launching in Mocha Brown, Black, Champagne Gold and Pink Gold, while the Mate 10 Pro will land in Midnight Blue, Titanium Gray, Mocha Brown and Pink Gold. The biggest difference though is that the Mate 10 Pro is IP67 certified water and dust resistant, meaning it can be submerged one meter deep for up to thirty minutes. This is one area where the differences aren’t entirely expected. While the Huawei Mate 10 has a 5.9-inch 1,440 x 2,560 screen with a pixel density of 499 pixels per inch, the Huawei Mate 10 Pro has a 6.0-inch 1,080 x 2,160 display with a pixel density of 402 pixels per inch. So unsurprisingly the Mate 10 Pro is slightly bigger, but what might surprise you is that its screen is lower resolution. That doesn’t make it worse though necessarily, especially as it uses OLED (where the Mate 10 uses LCD) and offers a greater contrast ratio. The Mate 10 Pro also has a super-widescreen 18:9 aspect ratio, while the Mate 10 has a more conventional 16:9 one. It’s not all different though, as both phones sport minimal bezel and support HDR10 content. Whichever one of these phones you opt for you’ll get an octa-core Kirin 970 chipset with four cores running at 2.36GHz and four clocked at 1.8GHz. The two phones also both come with a neural network processing unit (NPU), which is designed to use AI to improve performance and efficiency. They do differ in the amounts of RAM and storage they offer though, as the standard Mate 10 has 4GB of RAM and 64GB of storage, while the Mate 10 Pro is available in both that configuration and one with 6GB of RAM and 128GB of storage. So there’s potentially more power and storage in the Mate 10 Pro, however it doesn’t have a microSD card slot, which the standard Mate 10 does. There’s no difference in their operating systems though. Both the Huawei Mate 10 and the Mate 10 Pro run Android Oreo, overlaid with Huawei’s Emotion UI 8.0. There’s nothing to choose here, as both the Huawei Mate 10 and the Huawei Mate 10 Pro have a 20MP monochrome and 12MP color dual-lens camera pairing on the back. Although you can use the monochrome camera on its own for black and white shots, generally the camera will use both lenses at once and combine the resulting images for more detailed shots. On paper the camera sounds promising, sporting optical image stabilization and a large f/1.6 aperture, along with AI-powered scene and object recognition, allowing the camera to automatically optimize the settings for any given shot, but again, both phones include those things. Both phones also have an 8MP front-facing camera and a big 4,000mAh battery, which includes a smart battery management system to maximize life and can apparently get a full day’s worth of juice from a 20-minute charge. We don’t yet know the price of these phones in all regions, but in Australia the Huawei Mate 10 will cost AU$899 (around $710, £530), while the Huawei Mate 10 Pro will set you back AU$1,099 (around $865, £650). However, if you’re in the UK you won’t be able to buy the standard Mate 10 – only the Huawei Mate 10 Pro will be sold there. 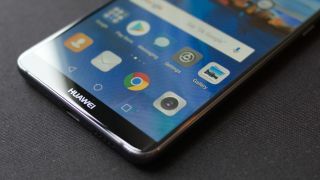 The main differences between the Huawei Mate 10 and the Huawei Mate 10 Pro are their price, with the Mate 10 Pro being more expensive, and their screens, with the Mate 10 Pro having a larger OLED screen, while the Mate 10 has a slightly smaller, sharper LCD one. There are also differences in their power and storage, as the Mate 10 Pro can be bought with more RAM and twice the internal capacity, though it doesn’t have a microSD card slot, which the standard Mate 10 does. The Mate 10 Pro also benefits from water resistance, but elsewhere these are very similar phones, with a similar design, identical cameras and batteries and the same chipset. Depending on where you live you may not even be able to choose between them, but assuming you do have the choice make sure to check our full reviews for both before buying either, because specs don’t always tell the whole story.